In my journey to reach my book reading goal this year, I have read books from all walks of life. I have recently read a lot of memoirs, but sometimes memoirs can be really depressing. I was looking for a light hearted book in the young adult section of the library last week and this is what I came up with. I chose it because I love Ella Enchanted, which is written by the same author. 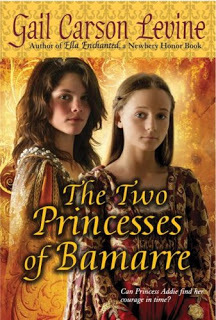 The Two Princesses of Bamarre was a cute story but no where near as well written as Ella Enchanted. It is pretty original, which I love. The whole story is based around finding a cure for a disease that is steadily killing off the kingdom. The story although predictable in fairy tale fashion took many twists and turns before ending up at the inevitable happily ever after. This book isn’t going to change your life, it isn’t full of literary value but you just might find it enjoyable.